Since it’s Sunday and I thought about it early enough in the day, I’m brining this chicken. It’s not absolutely necessary, but it adds immeasurable flavor and moisture. This technique is one that I saw on the PBS series “America’s Test Kitchen,” and I’ve been making it for years, with great results every time. This is a high-heat (500 degree) roast, so make sure you’re oven is impeccably clean, otherwise you’ll have a lot of smoke from old burnt-on bits. The entire dish cooks in one hour, so allow an hour and 15 minutes, including rest time for the bird. Start with a 3 – 4 lb. chicken (for 3 persons). 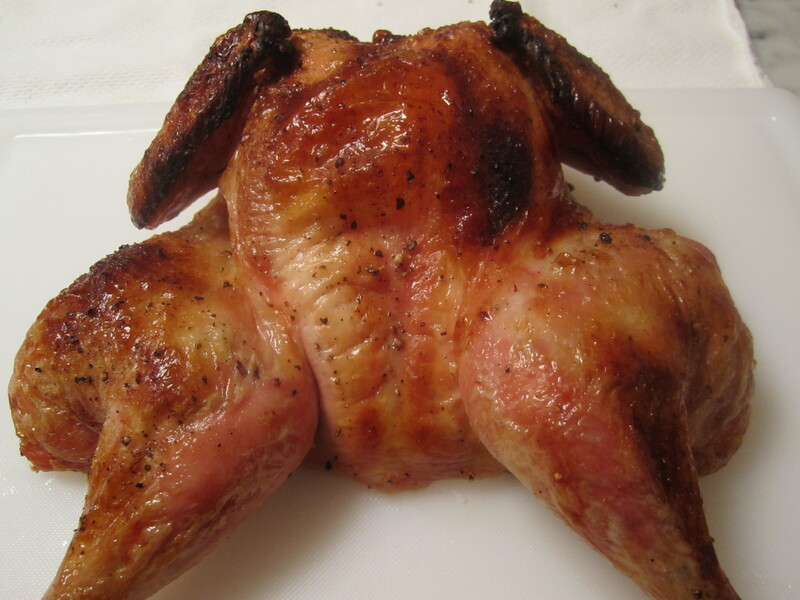 You must remove the backbone of your chicken (or ask your butcher to do it) so that the bird can be spread out flat. I like to accumulate the backbones in a ziploc bag in the freezer for broth. Once you remove the backbone, make the brine. In a large mixing bowl, simply combine 3/4 cup of salt; 1/4 cup of sugar and some hot water (just enough to melt the salt and sugar). Stir with your hands until they are dissolved. Then fill the remainder of the bowl with cold water (you don’t want the brine to heat the chicken–the brine should be cold to keep the chicken cold while it marinates). Place the bowl in the fridge for about 6 or 7 hours. Remove the bird from the brine and wipe dry with paper towels. 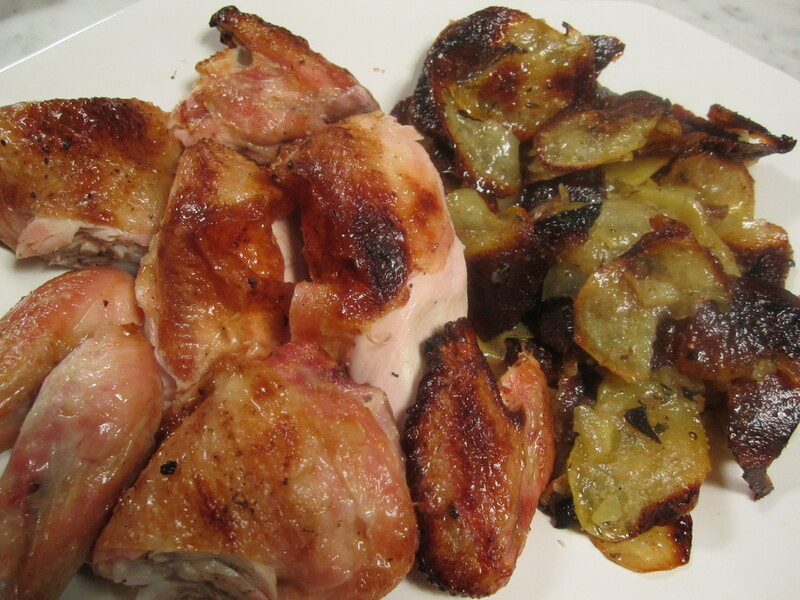 Lay the chicken flat (skin side up) on the perforated top of a broiling pan and leave at room temperature for about 45 minutes while you prepare the potatoes. Peel the potatoes, (I’ve used yukon golds) slice them with a mandolin slicer (figure on a potato-and-a-half per person) and spread them out on the bottom portion of the broiling pan, lined with heavy-duty tin foil (try to find heavy-duty–it will help greatly when you scoop out the finished potatoes–they tend to stick to the foil and heavy-duty foil is less likely to tear while you’re scraping off potatoes). Coat the potatoes with a couple of tablespoons of olive oil and a bit of salt (not too much), some pepper, and some fresh thyme (optional). 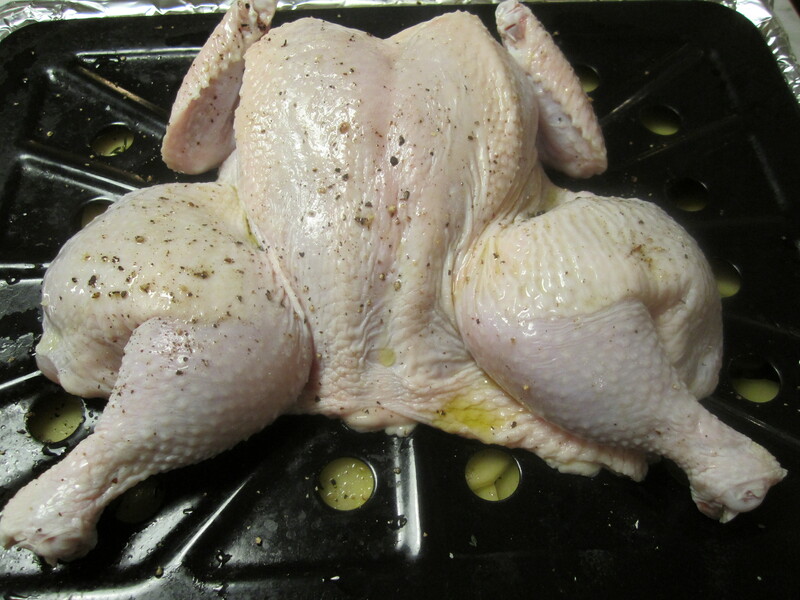 Replace the top portion of the broiling pan (containing the chicken) onto the tray and roast in the upper portion of a preheated 500-degree oven (turn on convection, if you have it). That’s it–no basting, no turning the potatoes–just let it all turn mahogany and crispy. After 45 minutes, take the chicken’s temperature (internal should be around 165 degrees). Let the chicken rest before carving. Because the backbone of the bird was removed–carving is a breeze. 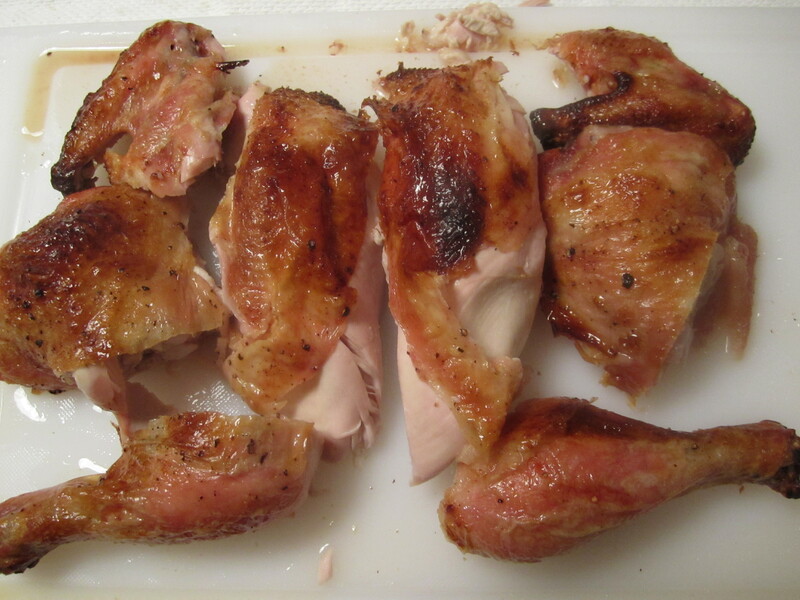 Just cut off the leg/thighs (they’ll practically fall off on their own) and divide them, remove the wings, then slice the breasts. 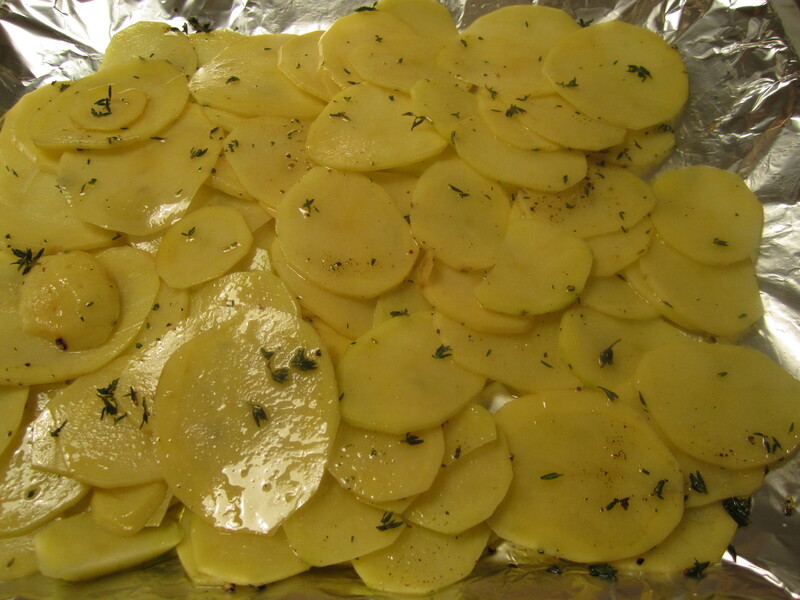 Remove the potatoes from the foil-covered bottom portion of the pan–they will be unevenly cooked–some will be dark brown, some golden, and some will remain pale. I promise–they will all taste wonderful together. The combination of cripsy and soft potato slices is great. Some juices from the chicken will have anointed the potatoes and they will be full of chicken flavor and salty goodness!